Keyword Tools - What Are They and How Can They Help You? The Internet offers an amazing plethora of information, but have you ever wondered how people know which information to provide? It all comes down to a proper use of keyword tools. In this article, we'll take a look at Wordtracker, Overture, Adwords and Google Trends and how they help webmasters. I assume that there are two main reasons for wanting to know what people are searching for on the Internet - curiosity and business reasons. Curiosity doesn't really need an explanation. It's interesting to see search data. If you just want to find out a bit more, then you're in luck. It's incredibly easy to get basic information on searches. Business reasons are a little more complicated. If someone wants to know about hot search trends for advertising or website building purposes, then there needs to be a bit more thought put into their search. They can't just stop with what people are looking for, they need to figure out why people are searching. That's a complicated topic and one that should be reserved for another article. Let's start with the basics. Google is a search engine provider, but it makes it money through selling ads. Naturally they're very tapped in to what people look for online. The primary tool is their Google Analytics software (we have a whole article on how to disable Google Analytics, if you don't like the idea of being spied on). They record the number of searches and gather basic information on who's looking at what. Nothing too Orwellian, but a few details on what regions and countries search for. If you'd like to tap into the lightest version of this, then just fire up Google Trends (trends.google.com). Google Trends is incredibly simple to use. You just type in a keyword and it will show you a chart detailing the rise and fall of interest in it over the course of the last few years. 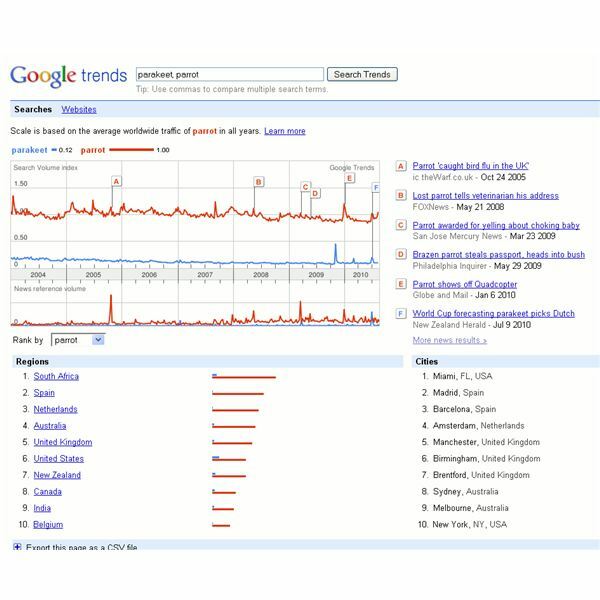 It also features a list of hot topics with long charts showing the breakdown of traffic based on countries. The program also lets you run comparisons between interesting keywords. If you search for more than two a time and separate them with a comma, then it will show side-by-side comparisons. I did a search comparing the terms "parrot" and "parakeet". It seems that parrots get much more attention and a lot of searches from people in South Africa. You can also check out individual website traffic through the same methods, if you're interested in how many people an individual website gets each month. The best part is that it's just as easy to use as Google, so if you were able to find this article you're probably able to use Google Trends. It's a little lacking for professional information, but it's fairly fun and a good way to find out about the latest trends online. While I'm covering Google's tools, I might as well cover the tools offered by Google Adwords (adwords.google.com). Since this program is based entirely on selling ads to run on Google Adsense, it has a lot of information on search trends. If you put a word or basic term into their box it should give a full list of related terms and give a rough estimate of how many people search for that word or phrase monthly. That's about it for the basic package, but it's fairly useful and available to anyone with an existing Google account. Note that it's pretty dry though and more for professionals looking for hot topics or undersaturated areas. Wordtracker (http://freekeywords.wordtracker.com/)is a bit of an interesting tool. It's also quite nice for people that don't want something as complex as Adwords. 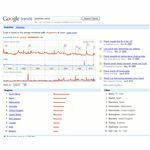 Wordtracker offers several different free keyword tools. One particularly nice one is the Wordtracker add-on, SEO Blogger, which works great with Firefox. Note that Wordtracker is a bit interesting. It doesn't gather information from Bing, Yahoo! or Google, but relies on the information gained from meta-search engines (like Dogpile). The reason for this is that the big three have too much noise from automated programs searching for terms, whereas meta-search engines are left alone. 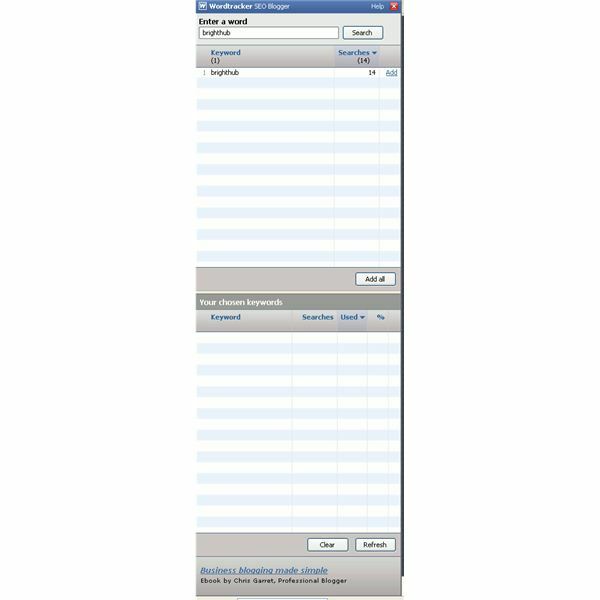 Therefore, the results in Wordtracker were real searches entered by a person, which can usually be extrapolated to help you figure out what people are searching for on the Internet. That said, this usually only accounts for 1% of searches, so there are occasional flukes where weird terms seem really hot. That said, I think that the best tool is their Gtrends search (http://freekeywords.wordtracker.com/gtrends/), which shows the same results but includes a link to Gtrends information which covers how many people go to the #1 search result in Google. If you ever wondered about the hottest search trends online, then hopefully these tools will be able to help. Google Trends, Google Adwords and Wordtracker are handy for seeing what people are looking for online and should be great for both casual observers and budding Internet entrepreneurs.